The perfect match: our indulgent hot chocolates have got together with the best coffee beans and made something beautiful – our Coffee Chocolat Lattes, in 6 delectable flavours. Those who know us know how seriously we take our cocoa – 100% dark Saint Lucia from our own Rabot Estate, anyone? – and now we’ve brought that same obsessive attention-to-detail to our coffee. We’ve selected our particular Arabica beans to complement our chocolate, and taken great care not to over-roast them so their sublime flavour comes through with every sip. Our Coffee Chocolat Lattes are made with chocolate, coffee beans and skimmed milk – that’s all. No syrups, no flavourings, no additives – and as always, faithful to our mantra: More Cocoa, Less Sugar. Those 6 gorgeous flavours we promised? Smooth 70% dark hot chocolate with skimmed milk and a double shot of espresso. Deep, malty salted caramel hot chocolate with a double espresso for extra kick. Savoury, complex Saint Lucian hot chocolate with skimmed milk and a double shot of espresso. Lusciously creamy white hot chocolate with a double espresso to pep you up. Sumptuous praline hot chocolate with a double shot of espresso for edge. Mildly spiced hot chocolate with a double espresso to raise your game. 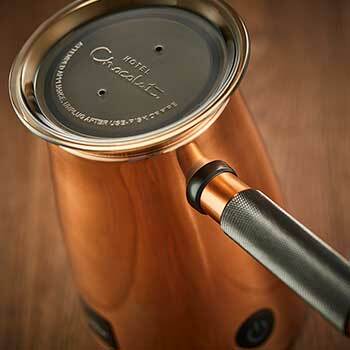 Drop by your nearest Hotel Chocolat café and find your new favourite!